Henley Rowing Club’s senior squad returned from a training camp in Banyoles to compete at the two day Metropolitan Regatta at Eton Dorney and bring home a brace of wins against stiff competition. Genevieve Bailhache-Graham took part in the Women’s IM2 single sculls race on Saturday, qualifying for the final through the repechage. Sculling strongly through the latter part of the race, she secured a respectable 4th place. The Men’s Elite quad of David Read, Josh Davidson, Tom Wilkinson and Jack Hockley took on Leander and Sir William Borlase in their Saturday final and finished an extremely close third place. 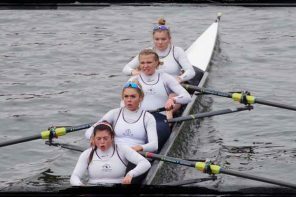 Competing in a new line-up on the Sunday, the Women’s IM1 quad of Rachel Loveridge, Rachel Barnes-Willis, Elizabeth Williams and Victoria Carver cruised through their heat to secure a place in the final. 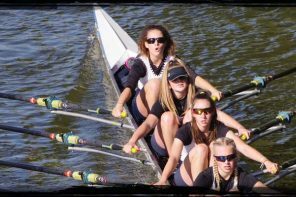 Racing more seasoned opposition, the girls were pleased to take 3rd place in the final narrowly being pipped for 2nd place. The Men’s Senior four of Stan Admiraal, Chris Mitchell, Andy Pettican and Richard Moody took fourth place in an exciting final that saw crews fighting the length of the course to dominate the race that was won by Imperial. 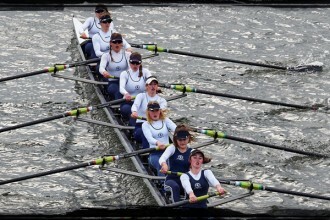 Genevieve Bailhache-Graham took to her single scull again on the Sunday, this time racing in the Women’s IM3 category. An exhilarating final saw Gen leave her last push until just before the line where she overtook the sculler from Exeter to take the gold medal. 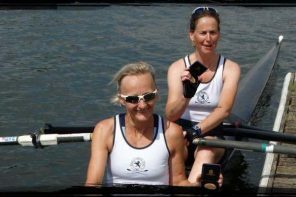 Earlier in the day, the Senior Women’s four of Amanda Hynes, Rachel Alder, Catriona Kay and Jenny Spencer consolidated a successful season so far with another win, this time in the combined Senior/IM1 category. The Henley crew led the race from the start, held off several pushes from the University of Durham crew and finished 3 lengths clear of the field.